Description: This tree is 40-65' tall at maturity, forming either a single trunk about 1½-3' across or developing multiple trunks. The crown is relatively open and irregular. On older trees, trunk bark is gray and rough-textured from coarse irregular furrows, while on young trees it is greenish yellow to golden brown and relatively smooth. Branches and twigs are greenish yellow, golden yellow, or golden brown, while young shoots are light green; the twigs and shoots are relatively slender and flexible. Alternate leaves about 2-4½" long and ¼-¾" across occur along the twigs and shoots; they are narrowly elliptic or narrowly lanceolate in shape and finely serrated along their margins. The upper surface of mature leaves is medium green and glabrous, while the lower surface is somewhat whitened, glabrous, and glaucous. Young leaves are yellowish green and they may have a few fine silky hairs. The narrow petioles are pale yellowish green and up to ½" long. At the bases of these petioles, pairs of stipules are either absent or early-deciduous. 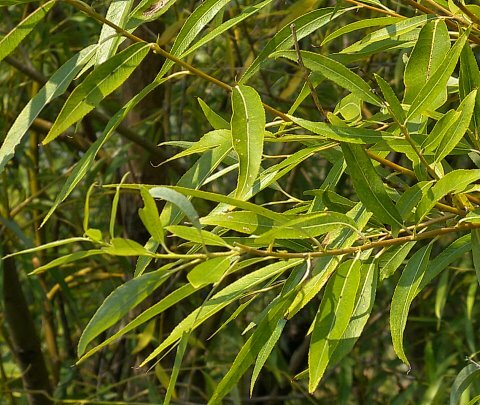 Golden Willow is dioecious, producing male (staminate) flowers and female (pistillate) flowers on separate trees. These flowers are arranged in narrowly cylindrical catkins about 1-2½" long; the catkins occur on short side shoots up to ¾" long that have 1-2 small leaves. Each male flower consists of 2 stamens (rarely 3) with yellow anthers. The filaments of the stamens are hairy below the middle and hairless above. Each female flower consists of a glabrous ovary on a short pedicel (about 1-2 mm. in length) with a pair of stigmata above. The green ovary is lanceoloid-pyriform in shape and 3-5 mm. in length. At the base of each flower (whether male or female), there is a yellow floral bract that is short-oblong in shape and hairy. The blooming period usually occurs from mid- to late spring for about 1-2 weeks. Female flowers become mature seed capsules about a month later, when they turn brown and split open to release their tiny seeds. These seeds are embedded in fine cottony hairs and they are distributed by the wind. The woody root system is abundantly branched and widely spreading. Cultivation: The preference is full or partial sun, wet to mesic conditions, and fertile soil is loamy or silty. This tree develops relatively rapidly, but it is not long-lived. The aggressive roots can clog underground water pipes and sewer lines. This tree is attacked by numerous insects and disease organisms. It is also prone to storm damage. Range & Habitat: The introduced Golden Willow rarely naturalizes in Illinois. Wild specimens of this tree have been found in only a few counties of the state. It is native to Eurasia. Habitats consist of riverbanks, areas near drainage ditches, shorelines of ponds, edges of floodplain woodlands, vacant lots, and roadsides. This willow can be found in disturbed areas in cities, suburbs, and neighboring areas. 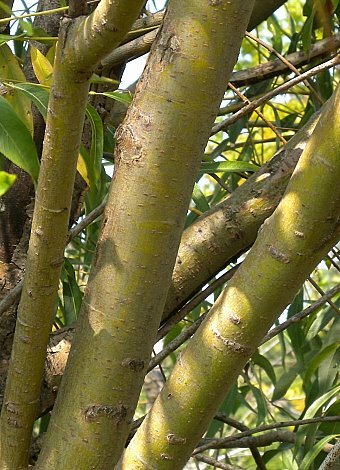 It is occasionally cultivated as a landscape tree because of its attractive yellow bark. Faunal Associations: The flowers of willows are cross-pollinated primarily by various kinds of bees and flies. Both nectar and pollen are available as floral rewards. Several Andrenid bees that can be found in the Midwest are oligoleges (specialist pollinators of willows): Andrena andrenoides, Andrena bisalicis, Andrena erythrogaster, Andrena illinoiensis, Andrena mariae, Andrena salictaria, and Andrena sigmundi. Other insects feed destructively on the leaves, sap, catkins, and wood of these trees. For example, the following leaf beetles are known to feed on White Willow (Salix alba), of which the Golden Willow is a cultivar or variety: Calligrapha multipunctata, Chrysomela knabi, Chrysomela scripta, Crepidodera solita, and Plagiodera versicolora. Other insect feeders include the larvae of metallic wood-boring beetles, the larvae of long-horned beetles, various kinds of weevils, the larvae of gall flies, plant bugs, stink bugs, aphids, leafhoppers, thrips, katydids, and the caterpillars of many moths. Caterpillars of the butterflies, Limenitis archippus (Viceroy) and Nymphalis antiopa (Mourning Cloark) feed on willow foliage, as do caterpillars of the skipper, Erynnis icelus (Dreamy Duskywing). Willows are an important resource to many vertebrate animals. Beavers use the wood, bark, and branches of willows as a source of food and construction material for their lodges and dams. The buds and/or catkins are eaten by the Ruffed Grouse, Red Squirrel, Fox Squirrel, and Gray Squirrel during the spring when other sources of food are limited. Both White-Tailed Deer and Elk browse on the twigs and leaves, while the Cottontail Rabbit gnaws on the bark of young trees and the Meadow Vole feeds fallen catkins. Because willows are host plants of a large number of insects, insectivorous songbirds often forage among their branches and leaves. These trees also provide nesting habitat for such birds as the Yellow Warbler, Warbling Vireo, and Rusty Grackle. Photographic Location: Along a drainage ditch in Urbana, Illinois. Comments: The yellow bark of Golden Willow is very unusual in appearance and interesting. There are some differences of opinion among authorities whether this tree should be considered a variety or a cultivar of Salix alba (White Willow). 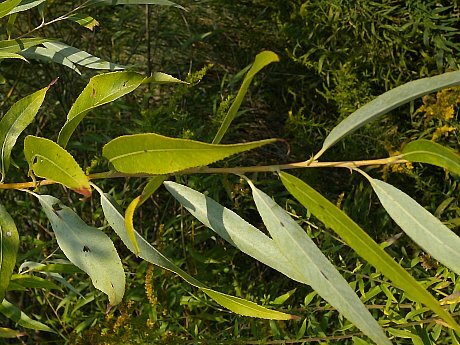 The typical variety (or cultivar) of White Willow differs from Golden Willow by having brown branches and twigs and leaves with white-hairy undersides. The Golden Willow should not be confused with the hybrid, Salix × sepulcralis (Golden Weeping Willow), which has strongly drooping branches. The Golden Weeping Willow is probably a hybrid between the Golden Willow and Salix babylonica (Weeping Willow). Like the Golden Willow, Golden Weeping Willow has striking yellow bark on its branches and twigs.